→Delta Industrial 46-460 Midi Lathe Review: Too Small? Delta Industrial 46-460 Midi Lathe Review: Too Small? Summary Overall a great piece of equipment. Very solidly built, very accurate, this should last you a lifetime if looked after well, (and who wouldn't?). Are you looking for a simple to use lathe to turn spindles, bowls, pens, ornaments or other small projects? If so, keep reading this Delta Industrial 46-460 Midi Lathe review. This lathe is not only sturdy and heavy duty, it also won the Editor’s Choice Best Overall Award in Taunton’s 2012 Tool Guide. What diameter will it fit? What’s the longest stock piece I can turn without having an extension? What’s the tool rest post size? How is it for turning bowls? Do I really need the reversing feature? Is there a speed indicator for the spindle? How many threads per inch (TPI) does it have? Every year, Taunton’s compiles the best of the best based on expert, unbiased reviews of over 200 tools available on the market and is compiled from the editors, readers and authors of Fine Homebuilding and Fine Woodworking magazines. This wood lathe is handy for a multitude of projects and can even handle heavy duty jobs. It’s great for professional woodworkers and hobbyists alike. It offers smooth, fast results with variable speeds for control and consistency. As far as its build, it’s made of strong cast iron and has a ball bearing live center with a steel knockout bar. The onboard storage makes it even handier so you don’t lose the included accessories. The motor has 1 horsepower and 1725 RPMs, with a 12.5” swing capacity, which is the largest it this class. The patented variable speed function makes it really easy to select the speed you need without changing the belt positions. It also has a forward and reverse function, which saves time. Instead of turning your project around to sand or polish in the opposite direction, you only need to flip a switch. If you only sand with the grain, or in one direction, wood fibers tend to lie down, leaving a rough finish. However, when you sand in the reverse direction, those fibers get shaved off making your project nice and smooth. 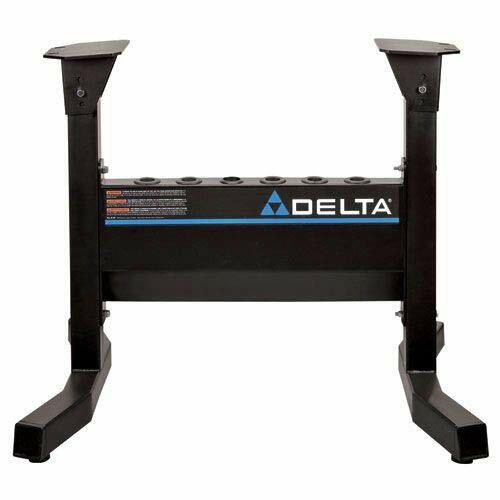 This Delta also includes a belt tensioning system that is patented so you can make fast changes in speed. It automatically sets the tension of the belt every time you use it for maximum efficiency. It also includes a six-groove belt so there is a lot more power for even larger projects. What diameter will it turn? From the center of the spindle to the top of the bed is 6.25”, so the maximum diameter would be just under 12.5”. This model is an A-8, so it has an 8 amp motor. The maximum distance between the centers is 16.5”. If you choose to get one bed extension, it will be as much as 42”. If you need a longer length, you can use more than one bed extension at the same time. The extensions add 25.5" to the center distance, and you can add up to 3 of them. The tool rest post is 5/8”, and you can get a larger banjo if you need it to be greater. According to user reviews, this lathe works great for bowls up to about twelve inches. In one review, a user says he does bowls of every kind as well as pens and other turnings. Another reviewer says it works great for Christmas ornaments as well. While some users won’t take advantage of the reversing feature, it’s actually really nice to have. It lets you sand in either direction, which can save time in turning around your project. If you sand from just one direction, some of the fibers will just bend over, and your sanding won’t look or feel even. It is important to know if you choose to use the reverse turn, make sure you get the chuck set screws nice and tight so it doesn’t unwind when going in the opposite direction. This model includes three different pulley choices for determining the speed. While there’s no digital gauge, this does keep the cost down and the machine simpler in design. You select the spindle speed by selecting different pulley combinations. They are 250-750 RPM; 600-1800 RPM and 1350-4000RPM. While there’s no readout, there is a variable speed dial for reference. There is a chart on the side of the lathe that lets you know how which speed range you’re in on the pulleys when you change the belt. What size is the spindle thread? On-board tool storage makes your work area more organized and safer. While it doesn’t come with a stand, Delta do make a very sturdy one shown above (Delta part # 46-462). There is also a modular bed extension available, this increases the effective length of the bed by 25.5". The standard distance between centers is 16.5" and the addition of one of these extensions will give you 42" between centers. (Delta part # 46-463). You can actually add 3 of these modular extensions to give a huge 93" between centers! Note that for every bed extension that you add, if using this stand, you also need to add a stand extension, (Delta part # 46-464), so if you wanted the 93" capacity, you would need to order 3 x stand extensions and 3 x bed extensions. However, some users either mount it directly on their workbench or to even make their own stand or rolling table so it has a stable surface. • Speed: 3 pulley speed ranges plus variable speed adjustment. Overall, users are really happy with this midi lathe. The only real complaint is that it won’t turn really large objects. The largest you can get up to is about twelve inches in diameter x 16.5" long. While most people won’t be working on projects larger than that, it’s good to know that if you want to do more, you’ll need to purchase one or more extensions. One bed extension will let you do up to a 42” long project. This award-winning lathe is a great tool for any smaller project like pens, holiday ornaments, chair spindles, bowls or candlestick holders, and with an extension can be used for longer and larger projects like turning baseball bats, table legs or even cue sticks. Its variable speeds, reversing feature and solid build make it a great tool to have on any workbench. Unlike many lathes, it offers a slow speed of 250 RPM (which is nice to have when starting a project) up to 4000 RPM, which is perfect for turning projects like pens and doing your finishing work. 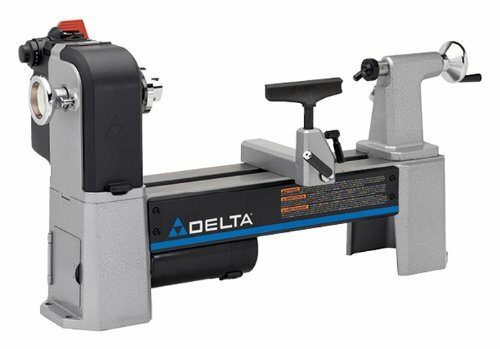 The Delta Industrial 46-460 Midi Lathe comes with the variable speed lathe, 10 and 6-inch tool rests, the tool rest base, a 3-inch chrome face plate, live center, knockout bar, wrenches and a user manual. For its price point, this is a great lathe to buy, and with its high review rating, it’s a good investment for any hobbyist or professional.